King of Swords (R) says that if you wish to achieve your goal – align your focus, will and intention so that it is moving in the same direction. Recognize injustice, unfairness or an unyielding decision – remain centered and focus on maintaining your balance. Recognize authority which has been corrupted – strength used for its own ends of power and dominance. See clearly the arrogance of a powerful mind turned in on itself, recognizing only its own desire for control. See your inventiveness – put your ideas into practice and bring them into your physical reality. At one extreme – an overly aggressive man, self-righteous or egomaniacal. At the other extreme, a weak, unassertive type with a lack of self-esteem. Who is laying down the law? How are you using your ability to be rational, logical and analytical? Who is judging or criticizing you? In the first position: Much of what you will be called upon to save will belong to many others. In the second position: At one extreme, this suggests that your past “safety net” is not as strong for you at this time. At the other extreme, there may be too much support that you have relied on too heavily for your own independent development. In the third position: Of course, you need to heed the King of Swords for your own benefit, but there are others who depend on you for your intelligence and courage. In the fifth position: You may think adversely about this king or he about you. You may believe that aggression is possible. In the sixth position: If this is someone already in your life, this may test your love. At one extreme, this can be too much imposition on you from outside, stifling your individuality and preferences, whether or not the intentions were good. In the seventh position: If this is someone already in your life, this may show a turn of mind between you. At one extreme there is too much authority and power. 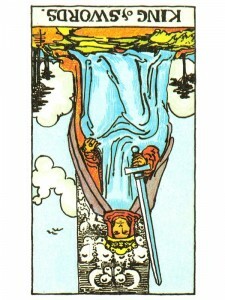 In the eighth position: At one extreme – you may have received poor advise or help with your material affairs or health. At the other extreme – you may be under someone’s influence or control that is not in your best interests. In the ninth position: Your heart may be involved with this King but rather not be. Or, the opposite, this can be the symbol of your heart’s sadness over this person. Someone may have been far too assertive or aggressiver for this situation.